Last fall we told you about our partnership with Omaha Public Power District, to bring solar panels to Med Center rooftops. We are happy to report that they are installed and producing electricity, making this installation the largest rooftop array in Nebraska. 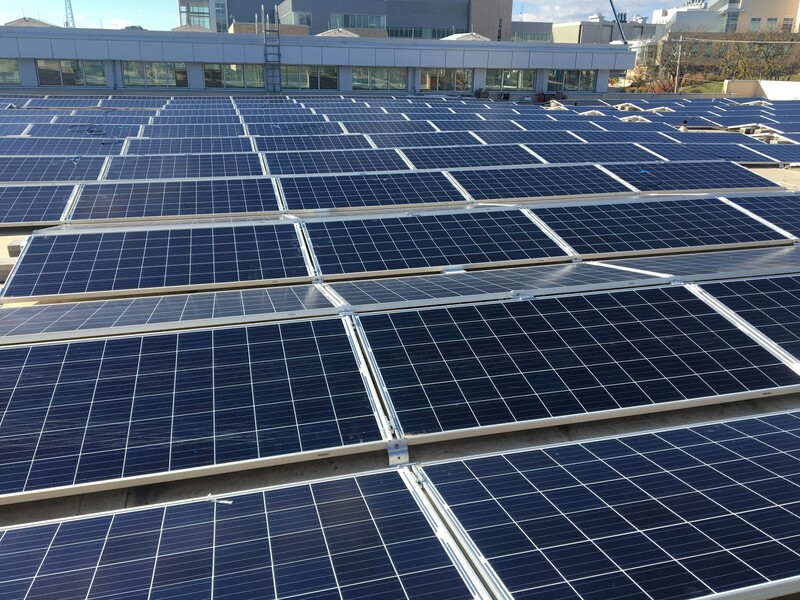 The 1,487 solar panels sit atop the three largest roof surfaces on campus — the Michael F. Sorrell Center for Health Science Education, the Stanley M. Truhlsen Eye Institute, and the Harold M. and Beverly Maurer Center for Public Health. The panels can generate up to 500 kilowatts of solar-powered electricity to help power the campus; and “its’ energy production will equal the average annual electricity use of 60 homes in OPPD’s service territory.” said Jared Friesen of Morrissey Engineering, which designed the project. The solar arrays are using a combination of east and west-facing panels, built to maximize the energy produced in each square foot of roof space used, while reducing shade between rows, and limiting the overall weight added to the roof, Friesen said. Darren Dageforde, executive director of utilities and energy utilization for UNMC, said the med center has already made great strides in reducing energy use and increasing efficiency. The project is part of an Interlocal Agreement between the OPPD Board of Directors and the UNMC Board of Regents. It is the latest in a number of energy-efficiency efforts added to the campus since 2012. Interested in solar at your home? The cost to install solar panels continues to decline, OPPD has outlined a process, Google’s Project Sunroof can help map your home’s solar exposure, and Nebraskans for Solar has great resources on all facets of solar.